Arnica /ˈɑːrnɪkə/ is a genus of perennial, herbaceous plants in the sunflower family (Asteraceae). The genus name Arnica may be derived from the Greek arni, "lamb", in reference to the plants' soft, hairy leaves. 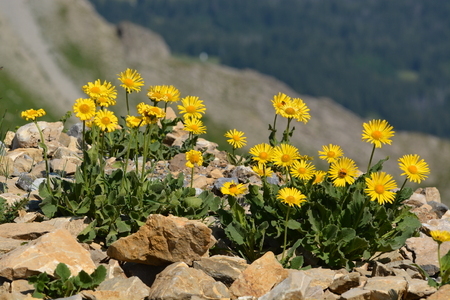 Arnica is also known by the names mountain tobacco and, confusingly, leopard's bane and wolfsbane—two names that it shares with the entirely unrelated genus Aconitum. This Circumboreal and montane (subalpine) genus occurs mostly in the temperate regions of western North America, with a few species native to the Arctic regions of northern Eurasia and North America. Several species, such as Arnica montana and A. chamissonis, contain helenalin, a sesquiterpene lactone that is a major ingredient in anti-inflammatory preparations (used mostly for bruises). Arnica species are used as food plants by the larvae of some Lepidoptera species including Bucculatrix arnicella. Arnica was previously classified in the tribe Senecioneae because it has a flower or pappus of fine bristles. They show large yellow or orange flowers, 6–8 cm (2–3 in) wide with 10–15 cm (4–6 in) long ray florets and numerous disc florets. The phyllaries (a bract under the flowerhead) has long spreading hairs. Each phyllary is associated with a ray floret. Species of Arnica, with an involucre (a circle of bracts arranged surrounding the flower head) arranged in two rows, have only their outer phyllaries associated with ray florets. The flowers have a slight aromatic smell. If taken in the wrong dose it can be very dangerous. The species Arnica montana, native to Europe, has long been used medicinally, but the effectiveness of this use has not been substantiated. Arnica montana contains the toxin helenalin, which can be poisonous if large amounts of the plant are eaten, and contact with the plant can also cause skin irritation.